Indicate by check mark whether the registrant has submitted electronically and posted on its corporate website, if any, every Interactive Data File required to be submitted and posted pursuant to Rule 405 of Regulation S-T (§229.405 of this chapter) during the preceding 12 months (or for such shorter period that the registrant was required to submit and post such files). The aggregate market value of the outstanding common stock, other than shares held by persons who may be deemed affiliates of the registrant, as of the last business day of the registrant’s most recently completed second fiscal quarter, which ended December 31, 2017 and based on the closing sale price as reported on the NASDAQ Global Select Market system, was approximately $402,500,000. As of September 5, 2018, there were 18,726,260 shares of the Registrant’s common stock, par value $0.01 per share, issued and outstanding. Portions of the proxy statement for the 2018 annual meeting of stockholders, which will be filed no later than 120 days after the close of the registrant’s fiscal year ended June 30, 2018, are incorporated by reference into Part III of this report. This Annual Report on Form 10-K contains forward-looking statements within the meaning of the Private Securities Litigation Reform Act of 1995. All statements contained in this Form 10-K that do not relate to matters of historical fact should be considered forward-looking statements, including but not limited to statements regarding our expected market share, business strategy, dealer network, anticipated financial results, and liquidity. We use words such as “could,” “may,” “might,” “will,” “expect,” “likely,” “believe,” “continue,” “anticipate,” “estimate,” “intend,” “plan,” “project,” and other similar expressions to identify some forward-looking statements, but not all forward-looking statements include these words. All of our forward- looking statements involve estimates and uncertainties that could cause actual results to differ materially from those expressed in the forward-looking statements. Accordingly, any such statements are qualified in their entirety by reference to the information described under the caption “Risk Factors” and elsewhere in this Form 10-K. The forward-looking statements contained in this Form 10-K are based on assumptions that we have made in light of our industry experience and our perceptions of historical trends, current conditions, expected future developments, and other factors we believe are appropriate under the circumstances. You should understand that these statements are not guarantees of performance or results. They involve risks, uncertainties (many of which are beyond our control), and assumptions. Although we believe that these forward-looking statements are based on reasonable assumptions, you should be aware that many important factors could affect our actual operating and financial performance and cause our performance to differ materially from the performance anticipated in the forward-looking statements. We believe these important factors include, but are not limited to, those described under “Risk Factors” and “Management’s Discussion and Analysis of Financial Condition and Results of Operations” in this Form 10-K and our other filings with the Securities and Exchange Commission (“SEC”). Should one or more of these risks or uncertainties materialize, or should any of these assumptions prove incorrect, our actual operating and financial performance may vary in material respects from the performance projected in these forward-looking statements. In addition, new important factors that could cause our business not to develop as we expect may emerge from time to time. Further, any forward-looking statement speaks only as of the date on which it is made, and except as required by law, we undertake no obligation to update any forward-looking statement contained in this Form 10-K to reflect events or circumstances after the date on which it is made or to reflect the occurrence of anticipated or unanticipated events or circumstances. The forward-looking statements contained herein should not be relied upon as representing our views as of any date subsequent to the filing date of this Form 10-K.
Our fiscal year begins on July 1 and ends on June 30 with the interim quarterly reporting periods consisting of thirteen weeks. Therefore, the quarter end will not always coincide with the date of the end of the calendar month. We refer to our fiscal years based on the calendar-year in which they end. Accordingly, references to fiscal 2018, fiscal 2017 and fiscal 2016 represent our financial results for the fiscal years ended June 30, 2018, June 30, 2017 and June 30, 2016, respectively. For ease of reference, we identify our fiscal years in this Form 10-K by reference to the period from July 1 to June 30 of the year in which the fiscal year ends. For example, “fiscal 2018” refers to our fiscal year ended June 30, 2018. Unless the context otherwise requires, the term “MasterCraft” refers to MasterCraft Boat Company, LLC and our MasterCraft-branded products; the term “NauticStar” refers to Nautic Star, LLC and our NauticStar-branded products; and the terms the “Company”, “we”, and “us” in this form 10-K refer to MCBC Holdings, Inc and its consolidated subsidiaries. We are a world-renowned innovator, designer, manufacturer, and marketer of premium performance sport boats and outboard boats, with a leading market position in the U.S., a strong international presence, and dealers in 46 countries around the world. Our boats are used for water skiing, wakeboarding, wake surfing, and fishing, as well as general recreational boating. We believe that MasterCraft is the most recognized brand name in the performance sport boat category. In October 2017, we acquired Nautic Star, LLC (“NauticStar”), a leading manufacturer and distributor of high-quality outboard bay boats, deck boats and offshore center console boats. NauticStar’s product portfolio provides diversification into the outboard category, the largest powerboat industry category in terms of retail units, according to the National Marine Manufacturers Association (“NMMA”). We are committed to delivering an extraordinary boating experience to our customers. From pioneering innovations that improve enjoyment on the water to offering products that promote rapid development of skills, our mission is to help our customers generate memories that will last a lifetime. We utilize a comprehensive product development process in order to build the most relevant and exciting products for our customers, year after year. We believe that our commitment to quality is unsurpassed, and we engage in operational excellence to deploy flexible and effective production systems that ensure we design and build the highest quality boats in the market. All of our boats, from hull to upholstery, are hand-crafted by our skilled workforce at our corporate headquarters near Knoxville, Tennessee, and our facility in Amory, Mississippi. In recent years, we have made significant investments in improving design, engineering, manufacturing, and operational processes as we strive to be the most efficient boat manufacturer in the industry. MasterCraft is the only boat manufacturer to achieve compliance with all three of the International Standard for Organization (“ISO”) 9001 (Quality Management Systems), 14001 (Environmental Management Systems), and 18001 (International Occupational Health and Safety Management System) standards. MasterCraft’s industry-leading operations result in world-class quality, which enables us to offer a best-in-class five-year factory warranty and results in MasterCraft boats typically maintaining higher aftermarket resale value than our competitors’ boats. We sell our boats through an extensive network of independent dealers in North America and internationally. Our MasterCraft boats are the exclusive performance sport boats offered by the majority of our dealers. Our acquisition of NauticStar has allowed us to expand our dealer network. We devote significant time and resources to find, develop, and improve the performance of our dealers. We continuously cultivate and strengthen our dealer relationships with marketing, training, and service programs designed to increase our dealers’ sales and profitability. We believe the strength of our dealer network and our proactive efforts to help our dealers improve their businesses give us a distinct competitive advantage in our industry. MasterCraft was founded in 1968 when we built our first custom hull ski boat in a two-stall horse barn on a farm in Maryville, Tennessee. Dissatisfied with the large wakes and pull of other ski boats, we designed a hull that had the smallest wake in the industry: smooth and low at slalom and jump speeds yet well-defined at trick speeds. Our roots in performance water ski boats were reinforced as we evolved over the next 50 years to produce leading performance-oriented boats in the wakeboarding and wake surfing categories. Today, we continue to produce the industry’s premier competitive water ski, wakeboarding, and wake surfing performance boats that also address our customers’ needs for versatility, flexibility, fun, and functionality. NauticStar was founded in 2002 and is located in Amory, Mississippi. We acquired NauticStar on October 2, 2017. With more than 15 years of boat manufacturing experience—including a 200,000 square-foot manufacturing facility—NauticStar has a reputation for reliability, quality and consistency, with a loyal network of dealers and customers including professional and sport fishermen, and recreational and pleasure boating enthusiasts. During 2017, retail sales of new powerboats in the U.S. totaled $9.6 billion. Of the powerboat categories tracked by the NMMA, our MasterCraft brand corresponds most directly to the inboard ski/wakeboard category, which we refer to as the performance sport boat category. The category that most directly corresponds to our NauticStar brand is the outboard category. We believe our addressable market also includes similar and adjacent powerboat categories identified by the NMMA, including sterndrive boats, inboard cruiser boats and jet boats. higher consumer confidence influenced by improving macroeconomic conditions, including increased home values, greater workforce participation and lower corporate and individual federal income tax rates, has helped to drive increased consumer demand for powerboats. As the recovery in the general economy and overall boating industry from the economic downturn that commenced in 2008 has continued, the performance sport boat and outboard categories have experienced a robust recovery. According to the NMMA, new unit sales of performance sport boats in the U.S. increased at a compound annual growth rate (“CAGR”) of 10.7% from 2014 to 2017 while new unit sales of all outboard boats grew at a CAGR of 6.9% in the U.S. over the same period. Total new unit sales of powerboats in the U.S. increased at a CAGR of 6.3% from 2014 to 2017. We believe the performance sport boat and outboard boat categories have grown at a faster rate than the rest of the powerboat industry due to increased innovation in the features, designs, and layouts of performance sport boats and outboard propulsion boats. These innovations have improved the performance, functionality, and versatility of these boats as compared with other recreational boats, particularly boats in the sterndrive category, which have not experienced the same degree of innovation. We believe inboard boats are superior to sterndrive boats for tow sports such as water skiing, wakeboarding, and wake surfing for several reasons, including (i) the larger and more propulsive wakes that only inboard engine configurations can enable, (ii) enhanced rider safety as a result of the location of the inboard propeller underneath the boat instead of protruding from the stern, as is generally the case with boats in the sterndrive category, and (iii) relatively more passenger and storage space due to the location of the inboard engine housing. We believe outboard boats are superior to sterndrive boats for recreational boating uses such as fishing and family boating for several reasons, including (i) relatively more passenger and storage space due to the location of the outboard engine housing, (ii) engine noise is significantly reduced in an outboard engines compared to a sterndrive engine, (iii) outboard engines are easier to access and maintain compared to a sterndrive engine, and (iv) outboard engines perform better and have greater durability in saltwater conditions. The expanding popularity of boating has also contributed to the strong recovery in volumes. We believe we are well-positioned to benefit from the increased popularity of recreational boating and the resulting larger prospective customer base. Iconic MasterCraft Brand Synonymous with Quality, Innovation, and Performance. We believe the MasterCraft brand is well-known among boating enthusiasts for high performance, premier quality, and relentless innovation. We believe that the market recognizes MasterCraft as a premier brand in the powerboat industry due to the overall superior value proposition that our boats deliver to our customers. The MasterCraft brand is built on a carefully crafted set of defining principles, including Legacy, Power, Precision and Progression. We work tirelessly every day to maintain our iconic brand reputation relative to our competition. The rigorous attention to detail with which we design and manufacture our products results in high quality boats that command significant resale premiums to comparable competitor boats. Leading Market Share Position in Performance Sport Boat and Outboard Categories. Over the last decade, we have consistently held a leading market share position in the U.S. among manufacturers of premium performance sport boats based on unit volume. According to the Statistical Surveys, Inc. (“SSI”), our performance sport boat U.S. market share in December of 2017 was 21.7%. Per SSI, our U.S. market share for deck boats in the 15’ – 30’ segment, sold by our NauticStar brand, was 13.4%. We believe our sales have grown as dealers and customers continue to recognize the superior quality, performance, styling, and value of our recently released boats and that we are just starting to realize the market share benefits of the many recent new product offerings and product enhancement initiatives that our management team has implemented during the past several years. Industry-Leading Product Design and Innovation. We believe that our innovation in the design of new boat models and new features has been a key to our success, helping us maintain our market share, command higher price points, and generally broaden the appeal of our products among recreational and fishing boaters. As a result of the features we have introduced, we believe that our boats are used for an increasingly wide range of activities. Our commitment to consistently developing new boat models and introducing new features is reflected in several notable recent achievements, including NMMA Innovation Awards for our MasterCraft ProStar water skiing boat, Gen 2 integrated surf system, X23 performance tow boat, and the DockStar Handling System. Our entire MasterCraft product portfolio has been renewed in the past five years, giving us the newest overall product offering in the performance sport boat category. Since acquiring NauticStar, we have introduced one new model, with future plans to introduce several new models over the coming years. Highly Efficient Product Development and Manufacturing. We believe that a key to our success has been our renewed focus on operational improvements and world-class business processes. We believe our new product development capabilities are industry-leading and enable us to consistently create unique high-performance hull shapes and product features in shorter design iterations and at lower development costs than our competitors. These capabilities enable us to precisely design custom hulls and performance features that enhance each boat’s unique performance characteristics and increase our speed to market with exciting new products. Our acquisition of NauticStar allows us to leverage this internal product development and manufacturing expertise to capitalize on operational improvement opportunities at our Amory, Mississippi facility. Strong Dealer Network. We have worked extensively with our dealers to develop what we believe is one of the strongest dealer networks in the performance sport boat and outboard categories. We target our distribution to the market segments’ highest performing dealers. We have established operating processes focused on optimizing dealers’ financial performance and service, and with a track record of balancing wholesale inventory and retail sales we are better able to manage dealer inventory, allowing for more transparent sales estimates and strong dealer relationships. We believe our warranty programs are more transparent than those of our competitors and provide consumers with greater peace of mind. Transparent and thorough warranty programs encourage customers to continue to visit our dealers for servicing, creating additional opportunities for boat trade-ins and purchases of accessories, thereby improving our dealers’ sales rates and financial health. These actions have strengthened our existing dealer network and are driving increased interest from new potential dealers who want to join the MasterCraft and NauticStar platforms. Differentiated Sales and Marketing Capabilities. We believe our marketing efforts support each of our brand promises by focusing on superior value proposition and differentiating the performance and features of our boats. Our marketing efforts are conducted using an array of strategies, which include digital advertising, social media engagement, advertisements in endemic media and the sponsorship of boating and water sport events. To highlight our MasterCraft performance credibility and generate additional brand excitement, we sponsor a number of nationally ranked athletes. We believe our superior sales and marketing capabilities effectively communicate our performance, styling, quality, authenticity, and lifestyle, resulting in increased overall customer engagement. Highly Experienced Executive Team. We have a highly seasoned and effective executive team. With an average of close to 30 years of boating industry experience, our management team has proven its ability to develop and integrate new product lines, enhance operations, strengthen our distribution network, and recruit industry talent. Senior management additions over the past few years have driven improvements to our manufacturing, quality, and product development systems and processes, which have collectively accelerated performance improvements as unit volumes have increased. Our President and Chief Executive Officer, Terry McNew, has 31 years of boating industry experience. He joined MasterCraft in August 2012 after serving as Executive Vice President of Brunswick Corporation’s recreational boat group, where he was in charge of manufacturing, product development, and engineering and quality systems. His leadership has helped us implement dramatic process improvements contributing to superior results. Tim Oxley, our Chief Financial Officer, has spent 28 years in the boating industry, including 12 years with MasterCraft, following 16 years with Brunswick Corporation where he served as Chief Financial Officer of several operating divisions. Tim Schiek, President of NauticStar since October 2017, is a 28-year marine industry veteran, having spent more than 20 years with Brunswick Corporation, serving in a variety of leadership roles. He has successfully run multiple well-known marine brands and brings key financial operational and dealer relationship experience to his role. Continue to Develop New and Innovative Products. As a leading innovator, designer, manufacturer, and marketer of premium performance sport boats, and high-quality bay, deck and center console outboard boats, we strive to design new and inventive products that appeal to a broad customer base. Since fiscal 2013, we have successfully launched a number of new products and features with best-in-class quality leading to increased sales and significant margin expansion. Furthermore, our unique new product development process enables us to renew our product portfolio with innovative offerings at a rate that we believe will be difficult for our competitors to match without significant additional capital investments. Our process involves each department in collaborative full “team” product launches that enable us to release several new models per year, per brand, while maintaining superior quality and controlling costs. Our entire MasterCraft product portfolio has been renewed in the past five years, and we have already released one new model at NauticStar since our acquisition in October 2017. We intend to continue releasing new products and features multiple times during the year, which we believe enhances our reputation as a cutting-edge boat manufacturer and will drive consumer interest in our products. boats allows us to attract customers from other boating categories, most notably from the sterndrive category. We intend to further enhance the performance, comfort, and versatility of our products to target additional customers seeking high performance water sport, fishing and general recreational activity. Continuous Operational Improvement to Drive Margin Expansion. We continue to implement a number of initiatives to reduce our cost base and to improve the efficiency of our manufacturing process. These process improvements have lowered re-work, warranty claims, material waste, and inventory levels, reducing our costs, and have driven improved on-time delivery rates. Since acquiring NauticStar in October 2017, we have worked to revamp NauticStar’s manufacturing and product development processes, which should lead to operational efficiencies and drive margin expansion going forward. Additionally, we have fostered a culture of operational improvement within our highly engaged workforce, at both MasterCraft and NauticStar. These processes are now ingrained in our culture, leading to a Company-wide focus on driving further margin expansion through continuous improvement. We believe these important process improvements and culture of operational excellence provide us with a strong operational foundation and margin improvement opportunities in the future. Effectively Manage Dealer Inventory and Further Strengthen Our Dealer Network. Our goal is to achieve and maintain a leading market share in each of the markets in which we operate. We view our MasterCraft and NauticStar dealers as our partners and product champions. Therefore, we devote significant time and resources to finding high quality dealers and developing and improving their performance over time. We actively manage dealer inventory levels, as demonstrated by healthy and consistent inventory retail turns and balanced wholesale and retail unit sales, which leads to better margins and improved financial health for our dealers. Additionally, our warranty programs for our products and predictable new product development cycles across our portfolio ensure that our dealers have high quality, compelling, and relevant products to sell to their customers. We believe the quality and trust in our dealer relationships are more beneficial to our long-term success than the quantity of dealers. We continue to leverage that dealer base while proactively developing strategies that will strengthen our overall network. For example, we intend to strengthen our current footprint by selectively recruiting market-leading dealers. We believe our targeted initiatives to enhance and grow our dealer network will increase unit sales in the future. Increase Our Sales in International Markets. We currently have an extensive international distribution network with 45 international dealers in 76 locations around the world. We believe MasterCraft is the most well-known brand in the performance sport boat category globally, and that NauticStar has the potential for global growth. Based on our brand recognition, innovative product offerings, and distribution strengths, we believe we are well positioned to leverage our reputation and capture additional international sales. We believe that we will increase our international sales by promoting our new products in developed markets where we have a well-established dealer base and in international markets where rising consumer incomes are expected to increase demand for recreational products, such as Australia, Europe, Israel, Dubai, and Brazil. We are also developing new product offerings that will specifically target certain product demand from our international consumers and that we believe will drive further sales growth in international markets. Net sales outside of North America represented 7.5% of net sales volume in fiscal 2018. We design, manufacture, and sell premium recreational performance sport boats and outboard boats that we believe deliver superior performance for water skiing, wakeboarding, wake surfing, and fishing, as well as general recreational boating. In addition, we offer various accessories, including trailers and aftermarket parts. We market our boats under two brands: MasterCraft and NauticStar. towards the consumer seeking the most premium and highest performance boating experience that we offer, and generally command a price premium over our competitors’ boats at retail prices ranging from approximately $60,000 to $200,000. The MasterCraft XT line was introduced in July 2016 as a multi-sport, category-defying crossover, with retail prices ranging from approximately $80,000 to $135,000. Unveiled in January 2014, the MasterCraft NXT line introduced the quality, performance, styling, and innovation of the MasterCraft brand to the entry-level consumer, with retail prices ranging from approximately $50,000 to $75,000. We have strategically designed and priced the MasterCraft NXT line to target the fast-growing entry-level customer group that is distinct from our traditional customer base, while maintaining our core MasterCraft brand attributes at profit margins comparable to our other offerings. Our NauticStar-branded portfolio of Nautic Bay Boats, Sport Deck Boats, Offshore Boats and Legacy Series boats are designed for a variety of uses, including recreational and competitive sport fishing in freshwater lakes or saltwater, and general recreational enjoyment. The Nautic Bay Boats and Offshore Boats are geared towards the consumer seeking unmatched quality and features for fishability and family friendly comfort. The Sport Deck Boat line caters to consumers seeking the drive and ride of a V-hull, large capacity, and the styling and efficiency of a runabout. The Legacy Series line is geared towards the consumer seeking the most premium and highest performance boating experience that NauticStar offers. NauticStar’s retail prices range from approximately $20,000 to $160,000. We rely on an extensive network of independent dealers to sell our products in North America and internationally. For both MasterCraft and NauticStar, we target our distribution to the market segment’s highest performing dealers. The majority of our MasterCraft dealers are exclusive to our MasterCraft product lines within the performance sport boat category, highlighting the commitment of our key dealers to MasterCraft boats. We establish performance criteria that our dealers must meet as part of their dealer agreements to ensure the continued quality of our dealer network. As members of our network, dealers in North America may qualify for floor plan financing programs, rebates, seasonal discounts, promotional co-op payments, and other allowances. We consistently review our distribution network to identify opportunities to expand our geographic footprint and improve our coverage of the market. We constantly monitor the health and strength of our dealers by analyzing each dealer’s retail sales and inventory frequently, and have established processes to identify underperforming dealers in order to assist them in improving their performance or to allow us to switch to a more effective dealer. These processes also allow us to better manage dealer inventory levels and product turns and contribute to a healthier dealer network that is better able to stock and sell our products. We believe our outstanding dealer network and our proactive approach to dealer management allow us to distribute our products more efficiently than our competitors and will help us capitalize on growth opportunities as our industry volumes continue to increase. For fiscal 2018 our combined MasterCraft and NauticStar top ten dealers accounted for approximately 33% of our gross sales and none of our dealers accounted for more than 6% of our total sales volume. North America. In North America, through our MasterCraft brand, we had a total of 95 dealers across 158 locations as of June 30, 2018. Through our NauticStar brand, in North America we had a total of 81 dealers across 95 locations as of June 30, 2018. We do not have a significant concentration of sales among our dealers. Outside of North America. As of June 30, 2018, through our MasterCraft brand, we had a total of 45 international dealers in 76 locations and through our NauticStar brand we had one international dealer with a single location. We are present in Europe, Australia, Africa, Asia, including Hong Kong and the Middle East. We generated 6.6%, 9.1% and 8.6% of our unit sales outside of North America in fiscal 2018, 2017, and 2016, respectively. We have developed a system of financial incentives for our dealers based on achievement of key benchmarks. In addition, we provide our dealers with comprehensive sales training and a complete set of technology-based tools designed to help dealers maximize performance. Our dealer incentive program has been refined through years of experience with some of the key elements including performance incentives, discounts paid for achieving volume and purchase scheduling targets, and cash discounts to encourage balanced demand throughout the year. In addition, at MasterCraft, we pay incentives for attending our annual dealer meeting, an event featuring a robust program of dealer training seminars that focus on areas such as sales growth, inventory management, and retail strategy, in addition to product-oriented information. This incentive payment is based on participation by all salespeople from a dealership, not solely the principals. Beyond our incentive programs, we have developed a proprietary web- based management tool that is used by our dealers on a day-to-day basis to improve their own businesses as well as enhance communication with our factory and sales management teams. Our proprietary DealerLink online business-to-business application efficiently executes many critical functions, including warranty registrations, warranty claims, boat ordering and tracking, parts ordering, technical support, and inventory reporting. This system facilitates communication between our sales team and the dealer network and allows our manufacturing department to review customer demand in real time. We manage our annual sales plan through distinct buying periods. Our rebates are tiered so that dealers have a financial incentive to take the stocking risk for boats purchased prior to the traditional retail selling season (April - June). These incentives, accompanied by floor plan subsidies for up to nine months from the date of invoice, drive “level loading” of production. During this first part of the model year, many of the dealers’ orders are standard configurations for their showrooms. In the second part of the model year, more boats are customized by retail customers. Many of these custom orders are placed during boat shows, which occur from January through early April across North America. We offer our dealers the opportunity to purchase boats with cash or through floor plan financing programs with third-party floor plan financing providers. We incentivize our dealers to purchase in cash by offering them a cash discount. The floor plan financing programs allow dealers to establish lines of credit with third-party lenders to purchase inventory. Upon purchase of a boat, dealers draw on the floor plan facility and the lenders pay the invoice price of the boat directly to us typically within 5 business days. Consistent with industry practice, we offer various manufacturer-sponsored floor plan interest programs under which we agree to reimburse our dealers for certain floor plan interest costs incurred for up to nine months from the date of invoice. In some cases, cash discounts are offered as an alternative to floor plan subsidies during the “off-season” for retail sales (July - March). These programs encourage dealers to rapidly replenish inventories during the spring and summer retail season, maintain sufficient inventories during the non-peak season, and balance wholesale purchases throughout the year. Pursuant to the terms of the floor plan financing, if a dealer defaults on the terms of its credit line, we agree to repurchase new inventory repossessed from dealerships. Our obligation to repurchase such repossessed products for the unpaid balance of our original invoice price for the boat is subject to reduction or limitation based on the age and condition of the boat at the time of repurchase, and in certain cases, by an aggregate cap on repurchase obligations associated with a particular floor plan financing program. We have not incurred any losses from a finance company mandated repurchase since the recession. There were no boats repurchased during the fiscal years ended June 30, 2018, 2017 or 2016. We believe that our differentiated marketing capabilities and our multi-channel, content-driven marketing strategies align with our strategic focus on product innovation, performance, and quality to attract aspiring and enthusiast consumers to our brands and products. These sales and marketing efforts allow us to more effectively launch and support our products, help drive actionable sales leads for our dealers, and reinforce our MasterCraft and NauticStar brand and lifestyle attributes. Our over 50-year history of manufacturing and design leadership has made MasterCraft one of the most well-known and iconic brands in the boating industry. We believe the MasterCraft brand is widely recognized even among non- enthusiasts. Our NauticStar brand is relatively young compared to MasterCraft, but has quickly established itself as a strong brand dedicated to innovation, style and quality. We are focused on enhancing the power of our brands through a multifaceted marketing strategy. Our addressable market is targeted through a variety of specialized means, ranging from event sponsorships to far-reaching strategic alliances. We have created a unified print and digital advertising strategy that is refreshed each year, featuring the unique attributes of each of our products while maintaining focus on the MasterCraft and NauticStar brands. We maintain a meaningful presence for our product lines in several endemic water sports and boating publications. Given the prevalence of our products in the markets these publications target, we also benefit from significant unpaid impressions in these industry publications, as our boats frequently appear in feature stories and advertisements for other products. In addition to these traditional marketing channels, in the last several years we have created an active and highly successful digital advertising and social media platform, including the use of Facebook, Twitter, Instagram, YouTube, and Vimeo to deliver content to our target audience, increase awareness of our brands, foster loyalty, and build a community of MasterCraft and NauticStar enthusiasts. In addition, we benefit from numerous user-generated videos and photos that are uploaded to these websites. An important component of this strategy has been our investment in our own mastercraft.com and nauticstarboats.com websites. The sites are designed to allow significant interaction between us and our customer base through marketing content delivery, message boards, news and event postings, and product updates and specifications. Our popular “Design-a-Boat” functionality allows consumers to design a boat and request a dealer quote. The custom-designed product can be transmitted directly to our closest independent dealer as well as our in-house concierge who follows up directly with our dealer leads on behalf of MasterCraft or NauticStar. Our leading position in the performance sport boat category is further supported by our sponsorship of some of the most recognizable and successful athletes in water sports, as well as a number of highly visible competitions and events around the world. Our activities in this area serve to deepen the penetration of our brands within the professional and enthusiast community, while also supporting the growth of the sports. The events which we sponsor and in which we and our dealers participate feature the most popular figures in wakeboarding and water skiing, drawing large audiences of enthusiasts to a variety of sites around the country. Furthermore, we sponsor top ranked professional wakeboarding athletes, water ski jumpers, and water skiers. In addition to the advertising generated by the athletes’ success in their sports, we also leverage our sponsorship of these athletes by having them attend boat shows and dealer events and appear in creative media events, in which they garner public relations interest, build our MasterCraft brand, and in many cases help sell our products directly to consumers. of our dealers, and to help them improve their businesses and their sales of MasterCraft and NauticStar products. Our strategy is to improve the individual market shares of each of our dealers in their respective markets, and to add new dealers in new markets or replace dealers in existing markets where we believe we can achieve improved market share and customer service. We utilize regular performance reviews to drive improvement in underperforming dealers and to determine how to transition to new dealers when necessary. In addition, we employ a number of tools to assist our dealers in improving their performance, including product, sales, and service training, marketing materials and content, and direct interaction with prospective customers such as our factory concierge service. We encourage and expect our sales representatives to serve as advisors to our dealers, and believe this proactive sales approach leads to better dealer relationships and higher sales of our products. All of our MasterCraft boats are designed, manufactured, and lake-tested in our Vonore, Tennessee facility. All of our NauticStar boats are designed and manufactured in our Amory, Mississippi facility. We believe MasterCraft is the only boat manufacturer to achieve compliance with all three of the ISO 9001 (Quality Management Systems), 14001 (Environmental Management Systems), and 18001 (International Occupational Health and Safety Management System) standards. The rigorous attention to detail with which we design and manufacture our MasterCraft products results in boats of high quality, which allows us to offer a “stem-to-stern” five-year warranty that comprehensively covers more parts of our boats than warranties offered by any of our competitors. In recognition of our operational excellence, we were named a 2015 IndustryWeek Best Plant in North America Recipient—the only boat manufacturer to receive that honor. Our boats are built through a continuous flow manufacturing process that encompasses fabrication, assembly, quality management, and testing. We manufacture certain components and subassemblies for our boats, such as upholstery, and procure other components from third-party vendors and install them on the boat. We have several exclusive supplier partnerships for critical purchased components, such as aluminum billet, towers, and engine packages. For MasterCraft, we also build custom trailers that match the exact size and color of our boats. We are strategically and financially committed to innovation, as reflected in our dedicated product development and engineering groups and evidenced by our track record of new product introduction. At MasterCraft, our product development and engineering group comprises 24 professionals. At NauticStar, our product development and engineering group comprises 7 professionals. These individuals bring to our product development efforts significant expertise across core disciplines, including boat design, computer-aided design, naval engineering, electrical engineering, and mechanical engineering. They are responsible for execution of all facets of our new product strategy, starting with design and development of new boat models and innovative features, engineering these designs for manufacturing, and integrating new boats and innovations into production without disruption, at high quality, on time and on budget. Our product development and engineering functions work closely with our Strategic Portfolio Management Team which includes senior leadership from Sales, Marketing and Finance, all working together to develop our long-term product and innovation strategies. a separate innovation development process which allows us to design innovative new features for our boats in a disciplined manner and to launch these innovations in a more rapid time frame and with higher quality. These enhanced processes have reduced the time to market for our new product pipeline. Our product development expense for fiscal 2018, 2017 and 2016 was $4.9 million, $3.6 million, and $3.5 million, respectively. We purchase a wide variety of raw materials from our supplier base, including resins, fiberglass, hydrocarbon feedstocks, and steel, as well as product parts and components such as engines and electronic controls, through a sales order process. We maintain long-term contracts with preferred suppliers and informal arrangements with other suppliers. We have not experienced any material shortages in any of our raw materials, product parts, or components. Temporary shortages, when they do occur, usually involve manufacturers of these products adjusting model mix, introducing new product lines, or limiting production in response to an industry-wide reduction in boat demand. We are focused on developing our supply chain to enable cost improvement, world-class quality, and continuous product innovation. We have engaged our top suppliers in collaborative preferred supplier relationships and have developed processes including annual cost reduction targets, regular reliability projects, and extensive product testing requirements to ensure that our suppliers produce at low cost and to the highest levels of quality expected of the MasterCraft and NauticStar brands. These collaborative efforts begin at the design stage, with our key suppliers integrated into design and development planning well in advance of launch, which allows us to control costs and to leverage the expertise of our suppliers in developing product innovations. We believe these collaborative relationships with our most important suppliers have contributed to our significant improvements in product quality, innovation, and profitability. The most significant components used in manufacturing our boats, based on cost, are engine packages. For our MasterCraft brand, Ilmor Engineering, Inc. (“Ilmor”) is our exclusive engine supplier, and for our NauticStar brand, Yamaha Motor Corporation (“Yamaha”) is out largest engine supplier. We maintain a strong and long-standing relationships with both Ilmor and Yamaha. As of June 30, 2018, Ilmor is our largest overall supplier. In addition to performance sport boat engines, Ilmor’s affiliates produce engines used in a number of leading racing boats and race cars. Ilmor maintains a full-time customer service and warranty staff located at our MasterCraft office, resulting in extremely efficient management of all engine-related matters, mitigating potential warranty risk. We work closely with Ilmor to remain at the forefront of engine design, performance, and manufacturing. Engine packages are the most expensive single item input in the MasterCraft boat-building process and we believe our long-term relationship with Ilmor is a key competitive advantage. We utilize third party logistics and transportation services at MasterCraft and NauticStar along with a fleet of leased tractor trailers at NauticStar, to deliver our boats to our dealer network. A select few dealers near our manufacturing facilities have elected to manage transportation and arrange for boats to be picked up directly from our manufacturing facilities. Following delivery to port, international shipments are transferred to a third-party logistics provider who schedules them for shipment via ocean freight to their destination country. infrastructure is an essential component of our dealer management initiatives, allowing for efficient and timely communications with our dealers and a transparent and effective system for dealer orders and production planning. We will continue to invest in our IT infrastructure in order to continue to leverage technology in support of our product development, manufacturing, and marketing strategies. We purchase insurance to cover standard risks in our industry, including policies that cover general product liability, workers’ compensation, auto liability, and other casualty and property risks. Our insurance rates are based on our safety record as well as trends in the insurance industry. We also maintain workers’ compensation insurance and auto insurance policies that are retrospective in that the cost per year will vary depending on the frequency and severity of claims in the policy year. We face an inherent risk of exposure to product liability claims in the event that, among other things, the use of our products results in injury. With respect to product liability coverage, we carry customary insurance coverage. Our coverage involves self-insured retentions with primary and excess liability coverage above the retention amount. We have the ability to refer claims to our suppliers and their insurers to pay the costs associated with any claims arising from such suppliers’ products. Our insurance covers such claims that are not adequately covered by a supplier’s insurance and provides for excess secondary coverage above the limits provided by our suppliers. We provide product warranties for all of our models at MasterCraft and NauticStar. The high quality and durability of our products allow us to offer a comprehensive warranty that covers more parts of our boats, which we believe is superior when compared to the warranties offered by our competitors. During the warranty period, we reimburse dealers and authorized service facilities for all or a portion of the cost of repair or replacement performed on the products. Some materials, components or parts of the boat that are not covered by our product warranties are separately warranted by their manufacturers or suppliers. These other warranties include warranties covering engines, among other components. We rely on a combination of patent, trademark, and copyright protection, trade secret laws, confidentiality procedures, and contractual provisions to protect our rights in our brand, products, and proprietary technology. We also protect our vessel designs through design registrations. This is an important part of our business and we intend to continue protecting our intellectual property. We currently hold 21 U.S. patents and 2 foreign patents, including utility and design patents for our transom surf seating, our DockStar handling system, and our Gen 2 surf system technology. Provided that we comply with all statutory maintenance requirements, our patents are expected to expire between 2021 and 2036. We also hold 14 pending U.S. patent applications and 3 pending foreign patent applications. We also own in excess of 90 registered trademarks in various countries around the world, most notably the MasterCraft and NauticStar names and logos, the Star Series, XSeries, XTSeries, and NXT MasterCraft product family names, the NauticStar product family names, and we own several applications for additional registrations. Such trademarks may endure in perpetuity on a country-by-country basis provided that we comply with all statutory maintenance requirements, including continued use of each trademark in each such country. In addition, we own 38 registered U.S. copyrights. Finally, we have registered 29 vessel hull designs with the U.S. Copyright Office, the most recent of which will remain in force through 2024.
cannot predict the outcome of any pending or future litigation, and an unfavorable outcome could have an adverse impact on our business, financial condition, or results of operations. The powerboat industry, including the performance sport boat and outboard categories, are highly fragmented, resulting in intense competition for customers and dealers. Competition affects our ability to succeed in both the market segments we currently serve and new market segments that we may enter in the future. We compete with several large manufacturers that may have greater financial, marketing, and other resources than we do. We also compete with a wide variety of small privately held independent manufacturers. Competition in our industry is based primarily on brand name, price, innovative features, design, and product performance. Please see Item 1A, “Risk Factors” — Risks Related to Our Business — Our industry is characterized by intense competition, which affects our sales and profits. Our operations are subject to extensive and frequently changing federal, state, local, and foreign laws and regulations, including those concerning product safety, environmental protection, and occupational health and safety. We believe that our operations and products are in compliance with these regulatory requirements. Historically, the cost of achieving and maintaining compliance with applicable laws and regulations has not been material. However, we cannot assure you that future costs and expenses required for us to comply with such laws and regulations, including any new or modified regulatory requirements, or to address newly discovered environmental conditions, will not have a material adverse effect on our business, financial condition, operating results, or cash flow. or investigation activities in connection with any contamination. However, future spills or accidents or the discovery of currently unknown conditions or non-compliances may give rise to investigation and remediation obligations or related liabilities and damage claims, which may have a material adverse effect on our business, financial condition, operating results, or cash flow. Certain materials used in our manufacturing, including the resins used in production of our boats, are toxic, flammable, corrosive, or reactive and are classified by the federal and state governments as “hazardous materials.” Control of these substances is regulated by the Environmental Protection Agency (EPA) and state pollution control agencies under the federal Resource Conservation and Recovery Act, and related state programs. Storage of these materials must be maintained in appropriately labelled and monitored containers, and disposal of wastes requires completion of detailed waste manifests and recordkeeping requirements. Any failure by us to properly store or dispose of our hazardous materials could result in liability, including fines, penalties, or obligations to investigate and remediate any contamination originating from our operations. The Occupational Safety and Health Administration (OSHA) Act imposes standards of conduct for and regulates workplace safety, including limits on the amount of emissions to which an employee may be exposed without the need for respiratory protection or upgraded plant ventilation. Our facilities are regularly inspected by OSHA and by state and local inspection agencies and departments. We believe that our facilities comply in all material aspects with these regulations. We have made a considerable investment in safety awareness programs and provide ongoing safety training for all of our employees. We have implemented a program that requires frequent safety inspections of our facilities by managers and an internal safety committee. The safety committee, which is led by a dedicated Health and Safety professional, prepares a monthly action plan based on its findings. The Clean Air Act (the “CAA”) and corresponding state rules regulate emissions of air pollutants. Because our manufacturing operations involve molding and coating of fiberglass materials, which involves the emission of certain volatile organic compounds, hazardous air pollutants, and particulate matter, we are required to maintain and comply with a CAA operating permit (or “Title V” permit). Our Title V Permit requires us to monitor our emissions and periodically certify that our emissions are within specified limits. To date, we have not had material difficulty complying with those limits. In addition to the regulation of our manufacturing operations, the EPA has adopted regulations stipulating that many marine propulsion engines meet an air emission standard that requires fitting a catalytic converter to the engine. The engines used in our products, all of which are manufactured by third parties, are warrantied by the manufacturers to be in compliance with the EPA’s emission standards. The additional cost of complying with these regulations has increased our cost to purchase the engines and, accordingly, has increased the cost to manufacture our products. If we are not able to pass these additional costs along to our customers, it may have a negative impact on our business and financial condition. Powerboats sold in the U.S. must be manufactured to meet the standards of certification required by the U.S. Coast Guard. In addition, boats manufactured for sale in the European Community must be certified to meet the European Community’s imported manufactured products standards. These certifications specify standards for the design and construction of powerboats. We believe that all our boats meet these standards. In addition, safety of recreational boats is subject to federal regulation under the Boat Safety Act of 1971, which requires boat manufacturers to recall products for replacement of parts or components that have demonstrated defects affecting safety. In the past, we have instituted recalls for defective component parts produced by us or certain of our third-party suppliers. None of these recalls has had a material adverse effect on our Company. We believe we maintain excellent relations with our employees, treating them as business partners and focusing on building their careers. We have approximately 882 employees as of June 30, 2018, 569 of whom work at our MasterCraft facilities in Tennessee, and 313 of whom work at our NauticStar facility in Mississippi. None of our employees are represented by a labor union, and since MasterCraft’s founding in 1968, we have never experienced a labor-related work stoppage. We were incorporated under the laws of the State of Delaware under the name MCBC Holdings, Inc. on January 28, 2000. In July 2015, we completed an initial public offering of our common stock. We maintain a website with the address www.mastercraft.com. We are not including the information contained in our website as part of, or incorporating it by reference into, this Annual Report on Form 10-K. We make available, free of charge through our website, our annual reports on Form 10-K, quarterly reports on Form 10-Q, current reports on Form 8-K, and amendments to these reports as soon as reasonably practicable after we electronically file these materials with, or otherwise furnish them to, the SEC. Investing in our common stock involves a high degree of risk. You should carefully consider the following risk factors, as well as other information in this Form 10-K, before deciding whether to invest in shares of our common stock. The occurrence of any of the events described below could harm our business, financial condition, results of operations, and growth prospects. In such an event, the trading price of our common stock may decline and you may lose all or part of your investment. General economic conditions, particularly in the U.S., affect our industry, demand for our products and our business, and results of operations. affect our business, financial condition and results of operations. We cannot predict the duration or strength of an economic recovery, either in the U.S. or in the specific markets where we sell our products. Corporate restructurings, layoffs, declines in the value of investments and residential real estate, higher gas prices, higher interest rates, and increases in federal and state taxation may each materially adversely affect our business, financial condition, and results of operations. Consumers often finance purchases of our products. Although consumer credit markets have improved, consumer credit market conditions continue to influence demand, especially for boats, and may continue to do so. There continue to be fewer lenders, tighter underwriting and loan approval criteria, and greater down payment requirements than in the past. If credit conditions worsen, and adversely affect the ability of consumers to finance potential purchases at acceptable terms and interest rates, it could result in a decrease in the sales of our products. Our annual and quarterly financial results are subject to significant fluctuations depending on various factors, many of which are beyond our control. Due to these and other factors, our results of operations may decline quickly and significantly in response to changes in order patterns or rapid decreases in demand for our products. We anticipate that fluctuations in operating results will continue in the future. Unfavorable weather conditions may have a material adverse effect on our business, financial condition, and results of operations, especially during the peak boating season. adversely affected if our net sales were to fall below expected seasonal levels during these periods. We may also experience more pronounced seasonal fluctuation in net sales in the future as we continue to expand our businesses. Additionally, to the extent that unfavorable weather conditions are exacerbated by global climate change or otherwise, our sales may be affected to a greater degree than we have previously experienced. There can be no assurance that weather conditions will not have a material effect on the sales of any of our products. We depend on our network of independent dealers, face increasing competition for dealers, and have little control over their activities. Substantially all of our sales are derived from our network of independent dealers. Our Mastercraft brand has agreements with dealers in its network that typically provide for one-year terms, although some agreements have a term of up to three years, while our NauticStar brand typically does not enter into dealer agreements with its dealers. For fiscal 2018, our top ten dealers accounted for 33% of our total gross sales. The loss of a significant number of these dealers could have a material adverse effect on our financial condition and results of operations. The number of dealers supporting our products and the quality of their marketing and servicing efforts are essential to our ability to generate sales. Competition for dealers among performance sport boat manufacturers continues to increase based on the quality, price, value, and availability of the manufacturers’ products, the manufacturers’ attention to customer service, and the marketing support that the manufacturer provides to the dealers. We face intense competition from other premium performance sport and outboard boat manufacturers in attracting and retaining dealers (some of whom also sell products from other premium performance sport and outboard boat manufacturers), affecting our ability to attract or retain relationships with qualified and successful dealers. Although our management believes that the quality of our products in the premium performance sport and outboard boat industries should permit us to maintain our relationships with our dealers and our market share position, there can be no assurance that we will be able to maintain or improve our relationships with our dealers or our market share position. In addition, independent dealers in the powerboat industry have experienced significant consolidation in recent years, which could result in the loss of one or more of our dealers in the future if the surviving entity in any such consolidation purchases similar products from a competitor. A substantial deterioration in the number of dealers or quality of our network of dealers would have a material adverse effect on our business, financial condition, and results of operations. Our success depends, in part, upon the financial health of our dealers and their continued access to financing. Because we sell nearly all of our products through dealers, their financial health is critical to our success. Our business, financial condition, and results of operations may be adversely affected if the financial health of the dealers that sell our products suffers. Their financial health may suffer for a variety of reasons, including a downturn in general economic conditions, rising interest rates, higher rents, increased labor costs and taxes, compliance with regulations, and personal financial issues. the overall creditworthiness of those dealers. We may be required to repurchase inventory of certain dealers. Many of our dealers have floor plan financing arrangements with third-party finance companies that enable the dealers to purchase our products. In connection with these agreements, we may have an obligation to repurchase our products from a finance company under certain circumstances, and we may not have any control over the timing or amount of any repurchase obligation nor have access to capital on terms acceptable to us to satisfy any repurchase obligation. This obligation is triggered if a dealer defaults on its debt obligations to a finance company, the finance company repossesses the boat and the boat is returned to us. Our obligation to repurchase a repossessed boat for the unpaid balance of our original invoice price for the boat is subject to reduction or limitation based on the age and condition of the boat at the time of repurchase, and in certain cases, by an aggregate cap on repurchase obligations associated with a particular floor plan financing program. We have not incurred any losses from a finance company mandated repurchase since the recession. No boats were repurchased during the fiscal years ended June 30, 2018, 2017 or 2016. In addition, applicable laws regulating dealer relations may also require us to repurchase our products from our dealers under certain circumstances, and we may not have any control over the timing or amount of any repurchase obligation nor have access to capital on terms acceptable to us to satisfy any repurchase obligation. If we were obligated to repurchase a significant number of units under any repurchase agreement or under applicable dealer laws, our business, operating results, and financial condition could be adversely affected. If we fail to manage our manufacturing levels while still addressing the seasonal retail pattern for our products, our business and margins may suffer. The seasonality of retail demand for our products, together with our goal of balancing production throughout the year, requires us to manage our manufacturing and allocate our products to our dealer network to address anticipated retail demand. Our dealers must manage seasonal changes in consumer demand and inventory. If our dealers reduce their inventories in response to weakness in retail demand, we could be required to reduce our production, resulting in lower rates of absorption of fixed costs in our manufacturing and, therefore, lower margins. As a result, we must balance the economies of level production with the seasonal retail sales pattern experienced by our dealers. Failure to adjust manufacturing levels adequately may have a material adverse effect on our financial condition and results of operations. We have a large fixed cost base that will affect our profitability if our sales decrease. The fixed cost levels of operating a powerboat manufacturer can put pressure on profit margins when sales and production decline. Our profitability depends, in part, on our ability to spread fixed costs over a sufficiently large number of products sold and shipped, and if we make a decision to reduce our rate of production, gross or net margins could be negatively affected. Consequently, decreased demand or the need to reduce production can lower our ability to absorb fixed costs and materially impact our financial condition or results of operations. Our industry is characterized by intense competition, which affects our sales and profits. manufacturers that may have greater financial, marketing, and other resources than we do and who are represented by dealers in the markets in which we now operate and into which we plan to expand. We also compete with a variety of small, independent manufacturers. We cannot assure you that we will not face greater competition from existing large or small manufacturers or that we will be able to compete successfully with new competitors. Our failure to compete effectively with our current and future competitors would adversely affect our business, financial condition, and results of operations. Our sales may be adversely impacted by increased consumer preference for used boats or the supply of new boats by competitors in excess of demand. During the economic downturn that commenced in 2008, we observed a shift in consumer demand toward purchasing more used boats, primarily because prices for used boats are typically lower than retail prices for new boats. If this were to occur again, it could have the effect of reducing demand among retail purchasers for our new boats. Also, while we have taken steps designed to balance production volumes for our boats with demand, our competitors could choose to reduce the price of their products, which could have the effect of reducing demand for our new boats. Reduced demand for new boats could lead to reduced sales by us, which could adversely affect our business, results of operations, and financial condition. Our sales and profitability depend, in part, on the successful introduction of new products. Market acceptance of our products depends on our technological innovation and our ability to implement technology in our boats. Our sales and profitability may be adversely affected by difficulties or delays in product development, such as an inability to develop viable or innovative new products. Our failure to introduce new technologies and product offerings that consumers desire could adversely affect our business, financial condition, and results of operations. Also, we have been able to achieve higher margins in part as a result of the introduction of new features or enhancements to our existing boat models. If we fail to introduce new features or those we introduce fail to gain market acceptance, our margins may suffer. In addition, some of our direct competitors and indirect competitors may have significantly more resources to develop and patent new technologies. It is possible that our competitors will develop and patent equivalent or superior technologies and other products that compete with ours. They may assert these patents against us and we may be required to license these patents on unfavorable terms or cease using the technology covered by these patents, either of which would harm our competitive position and may materially adversely affect our business. We also cannot be certain that our products or features have not infringed or will not infringe the proprietary rights of others. Any such infringement could cause third parties, including our competitors, to bring claims against us, resulting in significant costs and potential damages. Our international markets require significant management attention, expose us to difficulties presented by international economic, political, legal, and business factors, and may not be successful or produce desired levels of sales and profitability. insurrection or war that may disrupt or limit our relationships with our foreign customers. Our international operations may not produce desired levels of total sales, or one or more of the foregoing factors may harm our business, financial condition, or results of operations. Our results after the acquisition of NauticStar may suffer if we do not effectively manage our expanded operations following the acquisition. associated increased costs and complexity. There can be no assurances we will be successful or that we will realize the expected benefits currently anticipated from the acquisition of NauticStar. We have and will continue to incur significant acquisition-related integration costs and transaction expenses in connection with the acquisition of NauticStar and the related financing transactions. We are currently implementing a plan to integrate the operations of NauticStar. In connection with that plan, we anticipate that we may incur certain non-recurring charges. However, we cannot currently identify the timing, nature and amount of all such charges. Further, we have incurred significant transaction costs relating to negotiating and completing the acquisition of NauticStar. These integration costs and transaction expenses will be charged as an expense in the period incurred. The significant transaction costs and integration costs could materially affect our results of operations in the period in which such charges are recorded. Although we believe that the elimination of duplicative costs, as well as the realization of other efficiencies related to the integration of the business, will offset incremental transaction and integration costs over time, this net benefit may not be achieved in the near term, or at all. The NauticStar business may underperform relative to our expectations. We may not be able to maintain the levels of revenue, earnings or operating efficiency as a combined business that we and NauticStar have previously achieved or might achieve separately. The business and financial performance of NauticStar are subject to certain risks and uncertainties, including the risk of the loss of, or changes to, its relationships with its dealers and suppliers, increased product liability and warranty claims, and negative publicity or other events that could diminish the value of the NauticStar brand, which in turn could also adversely affect the MasterCraft brand. If we are unable to achieve the same growth, revenues and profitability that NauticStar has achieved in the past, our business, financial condition or results of operations could be adversely affected. Rising concern regarding international tariffs could materially and adversely affect our business and results of operations. The current political landscape has introduced significant uncertainty with respect to future trade regulations and existing international trade agreements, as shown by the recent U.S.-initiated renegotiation of the North America Free Trade Agreement, and Brexit in Europe. This uncertainty includes the possibility of imposing tariffs or penalties on products manufactured outside the U.S., including the recent announcement of the U.S. government’s institution of tariffs on a range of products from China, and the potential for increased trade barriers between the UK and the European Union. The institution of global trade tariffs carries the risk of negatively affecting global economic conditions, which could have a negative impact on our business and results of operations. The unaudited pro forma financial information we filed on Form 8-K/A on November 2, 2017 may not be indicative of our future results with NauticStar. assumptions used and adjustments made in preparing the unaudited pro forma financial information may prove to be inaccurate. Fluctuations in foreign currency exchange rates could result in declines in our reported sales and net earnings. The changing relationships of primarily the U.S. dollar to the Canadian dollar, the Australian dollar, the Euro, the British pound sterling, the Japanese yen, and certain other foreign currencies have from time to time had a negative impact on our results of operations. Fluctuations in the value of the U.S. dollar relative to these foreign currencies can adversely affect the price of our products in foreign markets and the costs we incur to import certain components for our products. In addition, we will often attempt to offset these higher prices with increased discounts, which can lead to reduced net sales per unit. We compete with a variety of other activities for consumers’ scarce leisure time. Our boats are used for recreational and sport purposes, and demand for our boats may be adversely affected by competition from other activities that occupy consumers’ leisure time and by changes in consumer lifestyle, usage pattern, or taste. Similarly, an overall decrease in consumer leisure time may reduce consumers’ willingness to purchase and enjoy our products. Our success depends upon the continued strength of our brands and the value of our brands, and sales of our products could be diminished if we, the athletes who use our products, or the sports and activities in which our products are used are associated with negative publicity. We believe that our brands are a significant contributor to the success of our business and that maintaining and enhancing our brands is important to expanding our consumer and dealer base. Failure to continue to protect our brands may adversely affect our business, financial condition, and results of operations. Negative publicity, including that resulting from severe injuries or death occurring in the sports and activities in which our products are used, could negatively affect our reputation and result in restrictions, recalls, or bans on the use of our products. Further, actions taken by athletes associated with our products that harm the reputations of those athletes could also harm our brand image and adversely affect our financial condition. If the popularity of the sports and activities for which we design, manufacture, and sell products were to decrease as a result of these risks or any negative publicity, sales of our products could decrease, which could have an adverse effect on our net sales, profitability, and operating results. In addition, if we become exposed to additional claims and litigation relating to the use of our products, our reputation may be adversely affected by such claims, whether or not successful, including by generating potential negative publicity about our products, which could adversely impact our business and financial condition. We may not be able to execute our manufacturing strategy successfully, which could cause the profitability of our products to suffer. Our manufacturing strategy is designed to improve product quality and increase productivity, while reducing costs and increasing flexibility to respond to ongoing changes in the marketplace. To implement this strategy, we must be successful in our continuous improvement efforts, which depend on the involvement of management, production employees, and suppliers. Any inability to achieve these objectives could adversely impact the profitability of our products and our ability to deliver desirable products to our consumers. Our ability to meet our manufacturing workforce needs is crucial to our results of operations and future sales and profitability. We rely on the existence of an available hourly workforce to manufacture our boats. We cannot assure you that we will be able to attract and retain qualified employees to meet current or future manufacturing needs at a reasonable cost, or at all. Although none of our employees are currently covered by collective bargaining agreements, we cannot assure you that our employees will not elect to be represented by labor unions in the future, which could increase our labor costs. Additionally, competition for qualified employees could require us to pay higher wages to attract a sufficient number of employees. Significant increases in manufacturing workforce costs could materially adversely affect our business, financial condition, or results of operations. We rely on third-party suppliers and, in particular, a single supplier of the engine packages used in the manufacturing of our boats. We depend on third-party suppliers to provide components and raw materials essential to the construction of our boats. While we believe that our relationships with our current suppliers are sufficient to provide the materials necessary to meet present production demand, we cannot assure you that these relationships will continue or that the quantity or quality of materials available from these suppliers will be sufficient to meet our future needs, irrespective of whether we successfully implement our growth strategy. As production increases, our need for raw materials and supplies will increase. Our suppliers must be prepared to ramp up operations and, in many cases, hire additional workers and/or expand capacity in order to fulfill the orders placed by us and other customers. Operational and financial difficulties that our suppliers may face in the future could adversely affect their ability to supply us with the parts and components we need, which could significantly disrupt our operations. The availability and cost of engines used in the manufacture of our boats are especially critical. For fiscal 2018, we purchased all of the inboard engine packages for our MasterCraft brand boats from Ilmor. We also maintain a strong and long-standing relationship with our primary supplier of NauticStar engine packages, Yamaha. While we believe that our relationships with Ilmor and Yamaha are sufficient to provide the materials necessary to meet present production demand, there can be no assurance that these relationships will continue or that the quantity or quality of the engines provided will be sufficient to meet our future needs, irrespective of whether we successfully implement our growth strategy. If we are required to replace these suppliers, it could cause a decrease in products available for sale or an increase in the cost of goods sold, either of which could adversely affect our business, financial condition, and results of operations. In addition to the risk of interruption of our engine supply, Ilmor or Yamaha could potentially exert significant bargaining power over price, quality, warranty claims, or other terms relating to the inboard engines we use. We are required to purchase a minimum volume of engines from Ilmor annually or pay a penalty to Ilmor in order to maintain our exclusivity. While these minimums are significantly below our current volumes, there can be no assurance that we will continue to meet these minimums in the future. Termination or interruption of informal supply arrangements could have a material adverse effect on our business or results of operations. We have informal supply arrangements with some of our suppliers, including the sole supplier of our gas and ballast tanks. In the event of a termination of a supply arrangement, there can be no assurance that alternate supply arrangements will be made on satisfactory terms. If we need to enter into supply arrangements on unsatisfactory terms, or if there are any delays to our supply arrangements, it could adversely affect our business and operating results. We depend upon key personnel and we may not be able to retain them or attract, assimilate, and retain highly qualified employees in the future. Our future success will depend in significant part upon the continued service of our senior management team and our continuing ability to attract, assimilate, and retain highly qualified and skilled managerial, product development, manufacturing, marketing, and other personnel. The loss of the services of any members of our senior management or other key personnel or the inability to hire or retain qualified personnel in the future could adversely affect our business, financial condition, and results of operations. We may attempt to grow our business through acquisitions or strategic alliances and new partnerships, which we may not be successful in completing or integrating. We may in the future explore acquisitions and strategic alliances that will enable us to acquire complementary skills and capabilities, offer new products, expand our consumer base, enter new product categories or geographic markets, and obtain other competitive advantages. We cannot assure you, however, that we will identify acquisition candidates or strategic partners that are suitable to our business, obtain financing on satisfactory terms, complete acquisitions or strategic alliances, or successfully integrate acquired operations into our existing operations. Once integrated, acquired operations may not achieve anticipated levels of sales or profitability, or otherwise perform as expected. Acquisitions also involve special risks, including risks associated with unanticipated challenges, liabilities and contingencies, and diversion of management attention and resources from our existing operations. Similarly, our partnership with leading franchises from other industries to market our products or with third-party technology providers to introduce new technology to the market may not achieve anticipated levels of consumer enthusiasm and acceptance, or achieve anticipated levels of sales or profitability, or otherwise perform as expected. Our intellectual property rights may be inadequate to protect our business. We attempt to protect our intellectual property through a combination of patent, trademark, copyright, protected design, and trade secret laws. We hold patents, trademarks, copyrights, and design rights relating to various aspects of our products and believe that proprietary technical know-how is important to our business. Proprietary rights relating to our products are protected from unauthorized use by third parties only to the extent that they are covered by valid and enforceable patents, trademarks, or copyrights, to the extent they are protected designs, or to the extent they are maintained in confidence as trade secrets. We cannot be certain that we will be issued any patents from any pending or future patent applications owned by or licensed to us, or that the claims allowed under any issued patents will be sufficiently broad to protect our technology. Further, the patents we own could be challenged, invalidated, or circumvented by others. Further, we cannot assure you that competitors will not infringe our patents, or that we will have adequate resources to enforce our patents. We also rely on unpatented proprietary technology. It is possible that others will independently develop the same or similar technology or otherwise obtain access to our unpatented technology. To protect our trade secrets and other proprietary information, we require employees, consultants, advisors, and collaborators to enter into confidentiality agreements. We cannot assure you that these agreements will provide meaningful protection for our trade secrets, know-how, or other proprietary information in the event of any unauthorized use, misappropriation, or disclosure of such trade secrets, know-how, or other proprietary information. If we are unable to maintain the proprietary nature of our technologies, we could be materially adversely affected. design lasts ten years. However, our protected vessel hull designs could be challenged, invalidated, or circumvented by others. Further, we cannot assure you that competitors will not infringe our designs, or that we will have adequate resources to enforce our rights. We rely on our trademarks, trade names, and brand names to distinguish our products from the products of our competitors, and have registered or applied to register many of these trademarks. We cannot assure you that our trademark applications will be approved. Third parties may also oppose our trademark applications, or otherwise challenge our use of the trademarks. In the event that our trademarks are successfully challenged, we could be forced to rebrand our products, which could result in loss of brand recognition, and could require us to devote resources to advertising and marketing new brands. Further, we cannot assure you that competitors will not infringe our trademarks, or that we will have adequate resources to enforce our trademarks. If third parties claim that we infringe upon their intellectual property rights, our financial condition could be adversely affected. We face the risk of claims that we have infringed third parties’ intellectual property rights. Any claims of patent or other intellectual property infringement, even those without merit, could be expensive and time consuming to defend, cause us to cease making, licensing, or using products that incorporate the challenged intellectual property, require us to redesign, reengineer, or rebrand our products, if feasible, divert management’s attention and resources, or require us to enter into royalty or licensing agreements in order to obtain the right to use a third party’s intellectual property. Any royalty or licensing agreements, if required, may not be available to us on acceptable terms or at all. A successful claim of infringement against us could result in our being required to pay significant damages, enter into costly license or royalty agreements, or stop the sale of certain products, any of which could have a negative impact on our business, financial condition, and results of operations. While we are not currently involved in any outstanding intellectual property litigation that we believe, individually or in the aggregate, will have a material adverse effect on our business, financial condition, or results of operations, we cannot predict the outcome of any pending litigation and an unfavorable outcome could have an adverse impact on our business, financial condition, or results of operations. Product liability, warranty, personal injury, property damage, and recall claims may materially affect our financial condition and damage our reputation. We are engaged in a business that exposes us to claims for product liability and warranty claims in the event our products actually or allegedly fail to perform as expected, or the use of our products results, or is alleged to result, in property damage, personal injury, or death. We have in the past incurred such liabilities and may in the future be exposed to liability for such claims. Although we maintain product and general liability insurance of the types and in the amounts that we believe are customary for the industry, we are not fully insured against all such potential claims. We may experience legal claims in excess of our insurance coverage or claims that are not covered by insurance, either of which could adversely affect our business, financial condition, and results of operations. Adverse determination of material product liability and warranty claims made against us could have a material adverse effect on our financial condition and harm our reputation. In addition, if any of our products are, or are alleged to be, defective, we may be required to participate in a recall of that product if the defect or alleged defect relates to safety. These and other claims we may face could be costly to us and require substantial management attention. Significant product repair and/or replacement due to product warranty claims or product recalls could have a material adverse impact on our results of operations. We provide a limited warranty for our products. We may provide additional warranties related to certain promotional programs, as well as warranties in certain geographical markets as determined by local regulations and market conditions. Although we employ quality control procedures, sometimes a product is distributed that needs repair or replacement. Our standard warranties require us or our dealers to repair or replace defective products during such warranty periods at no cost to the consumer. Historically, product recalls have been administered through our dealers and distributors. The repair and replacement costs we could incur in connection with a recall could adversely affect our business. In addition, product recalls could harm our reputation and cause us to lose customers, particularly if recalls cause consumers to question the safety or reliability of our products. The nature of our business exposes us to workers’ compensation claims and other workplace liabilities. Certain materials we use require our employees to handle potentially hazardous or toxic substances. While our employees who handle these and other potentially hazardous or toxic materials receive specialized training and wear protective clothing, there is still a risk that they, or others, may be exposed to these substances. Exposure to these substances could result in significant injury to our employees and damage to our property or the property of others, including natural resource damage. Our personnel are also at risk for other workplace- related injuries, including slips and falls. We have in the past been, and may in the future be, subject to fines, penalties, and other liabilities in connection with any such injury or damage. Although we currently maintain what we believe to be suitable and adequate insurance in excess of our self- insured amounts, we may be unable to maintain such insurance on acceptable terms or such insurance may not provide adequate protection against potential liabilities. We may be subject to information technology system failures, network disruptions, and breaches in data security. We use many information technology systems and their underlying infrastructure to operate our business. The size and complexity of our computer systems make them potentially vulnerable to breakdown, malicious intrusion, and random attack. Likewise, data privacy breaches by employees or others with permitted access to our systems may pose a risk that sensitive data may be exposed to unauthorized persons or to the public. While we have invested in protection of data and information technology, there can be no assurance that our efforts will prevent breakdowns or breaches in our systems that could adversely affect our business. An increase in energy costs may materially adversely affect our business, financial condition, and results of operations. Higher energy costs result in increases in operating expenses at our manufacturing facility and in the expense of shipping products to our dealers. In addition, increases in energy costs may adversely affect the pricing and availability of petroleum-based raw materials, such as resins and foams that are used in our products. Also, higher fuel prices may have an adverse effect on demand for our boats, as they increase the cost of ownership and operation. We are subject to U.S. and other anti-corruption laws, trade controls, economic sanctions, and similar laws and regulations, including those in the jurisdictions where we operate. Our failure to comply with these laws and regulations could subject us to civil, criminal, and administrative penalties and harm our reputation. Doing business on a worldwide basis requires us to comply with the laws and regulations of various foreign jurisdictions. These laws and regulations place restrictions on our operations, trade practices, partners, and investment decisions. In particular, our operations are subject to U.S. and foreign anti-corruption and trade control laws and regulations, such as the FCPA, export controls, and economic sanctions programs, including those administered by the U.S. Treasury Department’s Office of Foreign Assets Control, or OFAC. As a result of doing business in foreign countries and with foreign partners, we are exposed to a heightened risk of violating anti-corruption and trade control laws and sanctions regulations. The FCPA prohibits us from providing anything of value to foreign officials for the purpose of obtaining or retaining business or securing any improper business advantage. It also requires us to keep books and records that accurately and fairly reflect our transactions. Economic sanctions programs restrict our business dealings with certain sanctioned countries, persons, and entities. In addition, because we act through dealers and distributors, we face the risk that our dealers, distributors, or consumers might further distribute our products to a sanctioned person or entity, or an ultimate end-user in a sanctioned country, which might subject us to an investigation concerning compliance with OFAC or other sanctions regulations. Violations of anti-corruption and trade control laws and sanctions regulations are punishable by civil penalties, including fines, denial of export privileges, injunctions, asset seizures, debarment from government contracts, and revocations or restrictions of licenses, as well as criminal fines and imprisonment. We cannot assure you that all of our local, strategic, or joint partners will comply with these laws and regulations, in which case we could be held liable for actions taken inside or outside of the U.S., even though our partners may not be subject to these laws. Such a violation could materially and adversely affect our reputation, business, results of operations and financial condition. Our continued international expansion, including in developing countries, and our development of new partnerships and joint venture relationships worldwide increase the risk of FCPA or OFAC violations in the future. If we are unable to comply with environmental and other regulatory requirements, our business may be exposed to material liability and/or fines. Our operations are subject to extensive and frequently changing federal, state, local, and foreign laws and regulations, including those concerning product safety, environmental protection, and occupational health and safety. Some of these laws and regulations require us to obtain permits, and limit our ability to discharge hazardous materials into the environment. If we fail to comply with these requirements, we may be subject to civil or criminal enforcement actions that could result in the assessment of fines and penalties, obligations to conduct remedial or corrective actions, or, in extreme circumstances, revocation of our permits or injunctions preventing some or all of our operations. In addition, the components of our boats must meet certain regulatory standards, including stringent air emission standards for boat engines. Failure to meet these standards could result in an inability to sell our boats in key markets, which would adversely affect our business. Moreover, compliance with these regulatory requirements could increase the cost of our products, which in turn, may reduce consumer demand. While we believe that we are in material compliance with applicable federal, state, local, and foreign regulatory requirements, and hold all licenses and permits required thereunder, we cannot assure you that we will, at all times, be able to continue to comply with applicable regulatory requirements. Compliance with increasingly stringent regulatory and permit requirements may, in the future, cause us to incur substantial capital costs and increase our cost of operations, or may limit our operations, all of which could have a material adverse effect on our business or financial condition. As with most boat construction businesses, our manufacturing processes involve the use, handling, storage, and contracting for recycling or disposal of hazardous substances and wastes. The failure to manage or dispose of such hazardous substances and wastes properly could expose us to material liability or fines, including liability for personal injury or property damage due to exposure to hazardous substances, damages to natural resources, or for the investigation and remediation of environmental conditions. Under environmental laws, we may be liable for remediation of contamination at sites where our hazardous wastes have been disposed or at our current or former facilities, regardless of whether such facilities are owned or leased or whether the environmental conditions were created by us, a prior owner or tenant, or a third-party. While we do not believe that we are presently subject to any such liabilities, we cannot assure you that environmental conditions relating to our prior, existing, or future sites or operations or those of predecessor companies will not have a material adverse effect on our business or financial condition. Natural disasters, environmental disasters, the effects of climate change, or other disruptions at our manufacturing facilities or in other regions of the United States could adversely affect our business, financial condition, and results of operations. We rely on the continuous operation of our manufacturing facilities in Vonore, Tennessee and Armory, Mississippi for the production of our products. Any natural disaster or other serious disruption to our facility due to fire, snow, flood, earthquake, or any other unforeseen circumstance could adversely affect our business, financial condition, and results of operations. Changes in climate could adversely affect our operations by limiting or increasing the costs associated with equipment or fuel supplies. In addition, adverse weather conditions, such as increased frequency and/or severity of storms, or floods could impair our ability to operate by damaging our facilities and equipment or restricting product delivery to customers. The occurrence of any disruption at our manufacturing facilities, even for a short period of time, may have an adverse effect on our productivity and profitability, during and after the period of the disruption. These disruptions may also cause personal injury and loss of life, severe damage to or destruction of property and equipment, and environmental damage. Although we maintain property, casualty, and business interruption insurance of the types and in the amounts that we believe are customary for the industry, we are not fully insured against all potential natural disasters or other disruptions to our manufacturing facilities. In addition, we have dealers and third-party suppliers located in regions of the United States that have been and may be exposed to damaging storms, such as hurricanes and tornados, floods and environmental disasters. Although preventative measures may help to mitigate damage, the damage and disruption resulting from natural and environmental disasters may be significant. Such disasters can disrupt our dealers, suppliers, or customers, which can interrupt our operational processes and our sales and profits. Increases in income tax rates or changes in income tax laws or enforcement could have a material adverse impact on our financial results. Changes in domestic and international tax legislation could expose us to additional tax liability. Although we monitor changes in tax laws and work to mitigate the impact of proposed changes, such changes may negatively impact our financial results. In addition, any increase in individual income tax rates, such as those implemented in the U.S. at the beginning of 2013, would negatively affect our potential consumers’ discretionary income and could decrease the demand for our products. Our credit facilities contain covenants which may limit our operating flexibility; failure to comply with covenants may result in our lenders restricting or terminating our ability to borrow under such credit facilities. In the past, we have relied upon our existing credit facilities to provide us with adequate liquidity to operate our business. The availability of borrowing amounts under our credit facilities is dependent upon compliance with the debt covenants set forth in our credit agreement. Violation of those covenants, whether as a result of operating losses or otherwise, could result in our lenders restricting or terminating our borrowing ability under our credit facilities. If our lenders reduce or terminate our access to amounts under our credit facilities, we may not have sufficient capital to fund our working capital and other needs, and we may need to secure additional capital or financing to fund our operations or to repay outstanding debt under our credit facilities. We cannot assure you that we will be successful in ensuring the availability of amounts under our credit facilities or in raising additional capital, or that any amount, if raised, will be sufficient to meet our cash needs or will be on terms as favorable as those which have been available to us historically. If we are not able to maintain our ability to borrow under our credit facilities, or to raise additional capital when needed, our business and operations will be materially and adversely affected. You may be diluted by future issuances of common stock in connection with our incentive plans, acquisitions, or otherwise; future sales of such shares in the public market, or the expectations that such sales may occur, could lower our stock price. Our amended and restated certificate of incorporation authorizes us to issue shares of common stock and options, rights, warrants, and appreciation rights relating to common stock for the consideration and on the terms and conditions established by our board of directors in its sole discretion, whether in connection with acquisitions or otherwise. We have reserved shares for issuance under the Amended and Restated MCBC Holdings, Inc. 2015 Incentive Award Plan in an amount equal to 1,675,427 shares. Any common stock that we issue, including under our 2015 Incentive Award Plan or other equity incentive plans that we may adopt in the future, would dilute the percentage ownership of holders of our common stock. It is possible that an active trading market for our common stock will not be sustained, which could make it difficult for you to sell your shares of common stock at an attractive price or at all. changes in general market, economic, and political conditions in the U.S. and global economies or financial markets, including those resulting from natural disasters, terrorist attacks, acts of war, and responses to such events. As a result, volatility in the market price of our common stock may prevent investors from being able to sell their common stock at or above the price they paid for it or at all. These broad market and industry factors may materially reduce the market price of our common stock, regardless of our operating performance. In addition, price volatility may be greater if the public float and trading volume of our common stock is low. As a result, you may suffer a loss on your investment. We do not intend to pay dividends on our common stock for the foreseeable future. While we have paid dividends in the past, we presently have no intention to pay dividends on our common stock at any time in the foreseeable future. Any decision to declare and pay dividends in the future will be made at the discretion of our board of directors and will depend on, among other things, our results of operations, financial condition, cash requirements, contractual restrictions, and other factors that our board of directors may deem relevant. Certain of our debt instruments contain covenants that restrict the ability of our subsidiaries to pay dividends to us. In addition, we will be permitted under the terms of our debt instruments to incur additional indebtedness, which may restrict or prevent us from paying dividends on our common stock. Furthermore, our ability to declare and pay dividends may be limited by instruments governing future outstanding indebtedness we may incur. Delaware law and certain provisions in our amended and restated certificate of incorporation may prevent efforts by our stockholders to change the direction or management of our Company. we require advance notice and duration of ownership requirements for stockholder proposals. These provisions could discourage, delay, or prevent a transaction involving a change in control of our company. These provisions could also discourage proxy contests and make it more difficult for you and other stockholders to elect directors of your choosing and cause us to take other corporate actions you desire. In addition, because our board of directors is responsible for appointing the members of our management team, these provisions could in turn affect any attempt by our stockholders to replace current members of our management team. For as long as we are an emerging growth company, we will not be required to comply with certain reporting requirements, including those relating to accounting standards and disclosure about our executive compensation, that apply to other public companies. comply with the auditor attestation requirements of Section 404(b) of the Sarbanes-Oxley Act, (ii) reduced disclosure obligations regarding executive compensation in our periodic reports and proxy statements, and (iii) exemptions from the requirements of holding a non-binding advisory vote on executive compensation and of stockholder approval of any golden parachute payments not previously approved. We have elected to adopt these reduced disclosure requirements. We cannot predict if investors will find our common stock less attractive as a result of our taking advantage of these exemptions and as a result, there may be a less active trading market for our common stock and our stock price may be more volatile. We could remain an “emerging growth company” for up to five years or until the earliest of (a) the last day of the first fiscal year in which our annual gross revenues exceed $1.07 billion, (b) the date that we become a “large accelerated filer” as defined in Rule 12b-2 under the Securities Exchange Act of 1934, as amended (the “Exchange Act”), which would occur if the market value of our common stock that is held by non-affiliates exceeds $700 million as of the last business day of our most recently completed fiscal quarter, and (c) the date on which we have issued more than $1.07 billion in non-convertible debt securities during the preceding three-year period. The obligations associated with being a public company require significant resources and management attention, which may divert us from our business operations. As a result of our initial public offering, we are subject to the reporting requirements of the Exchange Act and the Sarbanes-Oxley Act. The Exchange Act requires that we file annual, quarterly, and current reports with respect to our business and financial condition. The Sarbanes-Oxley Act requires, among other things, that we establish and maintain effective internal controls and procedures for financial reporting. As a result, we have and will continue to incur significant legal, accounting, and other expenses that we did not previously incur. In addition, the need to establish the corporate infrastructure demanded of a public company may divert management’s attention from implementing our business strategy, which could prevent us from improving our business, results of operations, and financial condition. We have made, and will continue to make, changes to our internal controls, including information technology controls, and procedures for financial reporting and accounting systems to meet our reporting obligations as a public company. However, the measures we take may not be sufficient to satisfy our obligations as a public company. If we do not continue to develop and implement the right processes and tools to manage our changing enterprise and maintain our culture, our ability to compete successfully and achieve our business objectives could be impaired, which could negatively impact our business, financial condition, and results of operations. In addition, we cannot predict or estimate the amount of additional costs we may incur to comply with these requirements. We anticipate that these costs will be material to our general and administrative expenses. Furthermore, as a public company, we have and will continue to incur additional legal, accounting, and other expenses that have not been reflected in our historical financial statements. In addition, rules implemented by the SEC and NASDAQ have imposed various requirements on public companies, including establishment and maintenance of effective disclosure and financial controls and changes in corporate governance practices. Our management and other personnel will need to devote a substantial amount of time to these compliance initiatives. These rules and regulations result in our incurring legal and financial compliance costs and will make some activities more time-consuming and costly. For example, we expect these rules and regulations to make it more difficult and more expensive for us to maintain director and officer liability insurance, and we may be required to accept reduced policy limits and coverage or incur substantially higher costs to maintain the same or similar coverage. As a result, it may be more difficult for us to attract and retain qualified people to serve on our board of directors, on our board committees, or as executive officers. Our failure to achieve and maintain effective internal control over financial reporting in accordance with Section 404 of the Sarbanes-Oxley Act as a public company could have a material adverse effect on our business and share price. Prior to the completion of our initial public offering, we had not operated as a public company and were not required to independently comply with Section 404(a) of the Sarbanes-Oxley Act. Section 404(a) of the Sarbanes-Oxley Act requires annual management assessments of the effectiveness of our internal control over financial reporting, starting with the second annual report that we file with the SEC. We were required to meet these standards in the course of preparing our financial statements as of and for the year ended June 30, 2017, and our management is required to report on the effectiveness of our internal control over financial reporting for such year. Additionally, once we are no longer an emerging growth company, as defined by the JOBS Act, our independent registered public accounting firm will be required pursuant to Section 404(b) of the Sarbanes-Oxley Act to attest to the effectiveness of our internal control over financial reporting on an annual basis. The rules governing the standards that must be met for our management to assess our internal control over financial reporting are complex and require significant documentation, testing, and possible remediation. Internal control over financial reporting is a process designed to provide reasonable assurance regarding the reliability of financial reporting and the preparation of financial statements in accordance with generally accepted accounting principles. We are currently in the process of reviewing, documenting, and testing our internal control over financial reporting. We may encounter problems or delays in implementing any changes necessary to make a favorable assessment of our internal control over financial reporting. In addition, we may encounter problems or delays in completing the implementation of any requested improvements and receiving a favorable attestation in connection with the attestation to be provided by our independent registered public accounting firm after we cease to be an emerging growth company. If we cannot favorably assess the effectiveness of our internal control over financial reporting, or if our independent registered public accounting firm is unable to provide an unqualified attestation report on our internal controls after we cease to be an emerging growth company, investors could lose confidence in our financial information and the price of our common stock could decline. Additionally, the existence of any material weakness or significant deficiency may require management to devote significant time and incur significant expense to remediate any such material weaknesses or significant deficiencies and management may not be able to remediate any such material weaknesses or significant deficiencies in a timely manner. The existence of any material weakness in our internal control over financial reporting could also result in errors in our financial statements that could require us to restate our financial statements, cause us to fail to meet our reporting obligations, and cause stockholders to lose confidence in our reported financial information, all of which could materially and adversely affect our business and share price. If securities analysts do not publish research or reports about our company, or if they issue unfavorable commentary about us or our industry or downgrade our common stock, the price of our common stock could decline. The trading market for our common stock will depend in part on the research and reports that third-party securities analysts publish about our company and our industry. We may be unable or slow to attract research coverage and if one or more analysts cease coverage of our company, we could lose visibility in the market. In addition, one or more of these analysts could downgrade our common stock or issue other negative commentary about our company or our industry. As a result of one or more of these factors, the trading price of our common stock could decline. All our MasterCraft boats are designed, manufactured, and lake-tested at our 252,000-square-foot manufacturing facility located on approximately 60 acres of lakefront land we own in Vonore, Tennessee. All our NauticStar boats are designed and manufactured in our more than 200,000-square-foot manufacturing facility located on 17 acres of land we own in Amory, Mississippi. In addition, we lease a 60,000 square-foot facility in Vonore where we manufacture our trailers, and a 3,000 square-foot warehouse facility in West Yorkshire, England for warehousing of aftermarket parts. ITEM 5.MARKET FOR REGISTRANT’S COMMON EQUITY AND RELATED STOCKHOLDER MATTERS AND ISSUER PURCHASES OF EQUITY SECURITIES. On September 4, 2018, the last reported sale price on the NASDAQ Global Market of our common stock was $27.92 per share. As of September 5, 2018, we had 29 holders of record of our common stock. The actual number of stockholders is greater than this number of record holders, and includes stockholders who are beneficial owners, but whose shares are held in street name by brokers and other nominees. This number of holders of record also does not include stockholders whose shares may be held in trust by other entities. On May 26, 2016, we declared a special dividend of $4.30 per share which was paid on June 10, 2016. No dividends were declared or paid during the fiscal years ended June 30, 2018 or June 30, 2017. We presently intend to retain our earnings, if any, to finance the development and growth of our business and operations and do not anticipate declaring or paying cash dividends on our common stock in the foreseeable future. Any future determination as to the declaration and payment of dividends, if any, will be at the discretion of our board of directors and will depend on then-existing conditions, including our operating results, financial condition, contractual restrictions, capital requirements, business prospects, and other factors our board of directors may deem relevant. In addition, our $145 million senior secured credit facility under a third amended and restated credit and guaranty agreement with Fifth Third Bank (the “Third Amended Credit Agreement”) contains restrictions that restrict our ability to pay cash dividends. See Item 1A “Risk Factors” — Risks Relating to Ownership of Our Common Stock — We do not intend to pay dividends on our common stock for the foreseeable future. This performance graph shall not be deemed “soliciting material” or to be “filed” with the SEC for purposes of Section 18 of the Exchange Act of 1934, or otherwise subject to the liabilities under that section, and shall not be deemed to be incorporated by reference into any filing of ours under the Securities Act or the Exchange Act. The following stock performance graph illustrates the cumulative total shareholder return on our common stock for the period from July 17, 2015 (the first day of trading for our common stock) to June 30, 2018, as compared to the Russell 2000 Index and the Dow Jones US Recreational Products Index. The comparison assumes (i) a hypothetical investment of $100 in our common stock and the two above mentioned indices on July 17, 2015 and (ii) the full reinvestment of all dividends. The comparisons in the graph and table are required by the SEC and are not intended to be indicative of possible future performance of our common stock. For information regarding securities authorized for issuance under our equity compensation plans, see Note 13: Stock-Based Compensation in Item 8 and Item 12: Security Ownership of Certain Beneficial Owners and Management and Related Stockholder Matters. The selected historical consolidated financial data and other data of MCBC Holdings, Inc. set forth below should be read together with “Management’s Discussion and Analysis of Financial Condition and Results of Operations” and our consolidated financial statements and related notes, each of which is included elsewhere in this Form 10-K.
We derived the consolidated statement of operations for the fiscal years ended June 30, 2018, June 30, 2017 and June 30, 2016 and our consolidated balance sheet data as of June 30, 2018 and 2017 from our audited consolidated financial statements and related notes included elsewhere in this Form 10-K. We derived the consolidated statement of operations for the fiscal years ended June 30, 2015 and June 30, 2014 and our consolidated balance sheet data as of June 30, 2016, June 30, 2015 and June 30, 2014 from audited consolidated financial statements, which are not included in this Form 10-K. Our historical results are not necessarily indicative of the results that may be expected in the future. The weighted average shares used for computation of basic and diluted earnings per common share gives effect to the 11.139-for-1stock split consummated on July 22, 2015 in connection with the Company’s initial public offering and excludes the 6,071,429 shares sold for periods prior to fiscal year ended June 30, 2016. ITEM 7.MANAGEMENT'S DISCUSSION AND ANALYSIS OF FINANCIAL CONDITION AND RESULTS OF OPERATIONS. The following discussion and analysis should be read together with the sections entitled “Risk Factors,” “Selected Financial Data,” and the financial statements and the accompanying notes included elsewhere in this Form 10-K. In addition, the statements in this discussion and analysis regarding industry outlook, our expectations regarding the performance of our business, anticipated financial results, liquidity and the other non-historical statements are forward-looking statements. These forward-looking statements are subject to numerous risks and uncertainties, including, but not limited to, the successful integration of Nautic Star, LLC into our business and the risks and uncertainties described in “Cautionary Note Regarding Forward-Looking Statements” and in “Risk Factors” above. Our actual results may differ materially from those contained in or implied by any forward-looking statements. We are a world-renowned innovator, designer, manufacturer, and marketer of premium performance sport boats and outboard boats, with a leading market position in the U.S., a strong international presence, and dealers in 46 countries around the world. Our boats are used for water skiing, wakeboarding, wake surfing, and fishing, as well as general recreational boating. We operate in two reportable segments: MasterCraft and NauticStar. We believe that MasterCraft is the most recognized brand name in the performance sport boat category. In October 2017, we acquired NauticStar, a leading manufacturer and distributor of high-quality outboard bay boats, deck boats and offshore center console boats. NauticStar’s product portfolio provides diversification into the outboard category, the largest powerboat industry category in terms of retail units. We sell our boats through an extensive network of independent dealers in North America and internationally. Through our MasterCraft segment, we partner with 95 North American dealers with 158 locations and 45 international dealers with 76 locations throughout the world. Through our NauticStar segment, we partner with 81 North American dealers with 95 locations and 1 international dealer with a single location. In fiscal 2018, 92.5% of our net sales were generated from North America and 7.5% of our net sales were generated from outside of North America. Our sales are impacted by general economic conditions, which affect the demand for our products, the demand for optional features, the availability of credit for our dealers and retail consumers, and overall consumer confidence. While the performance sport boat and outboard categories have grown in recent years, new unit sales remain significantly below historical peaks. While there is no guarantee that our market will continue to grow, we believe that increased consumer demand, limited used boat inventory, and the superior quality, performance, styling, and value proposition of our recently released boats present a long runway for future growth. Our revamped manufacturing and product development processes have led to operational efficiencies which we expect will continue to drive margin expansion. On October 2, 2017, we completed the acquisition of NauticStar. The aggregate purchase price was $80.5 million, including customary adjustments for the amount of working capital in the acquired business at the closing date. A portion of the purchase price was deposited into an escrow account in order to secure certain post-closing obligations of the former members of NauticStar. On October 2, 2017, we entered into a Third Amended Credit Agreement with Fifth Third Bank, as the agent and letter of credit issuer, and the lenders party thereto. The Third Amended Credit Agreement replaced and paid off our Second Amended and Restated Credit Agreement, dated May 27, 2016 (the “Prior Credit Agreement”). The Third Amended Credit Agreement provides us with a $145 million senior secured credit facility, consisting of a $115 million term loan (the “Third Term Loan”) and a $30 million revolving credit facility (the “Revolving Credit Facility”). A portion of the proceeds from the Third Term Loan was used to fund our acquisition of NauticStar. On October 17, 2017, December 1, 2017, February 28, 2018, April 30, 2018 and May 31, 2018, we made voluntary payments on the Third Term Loan of $10.0 million, $7.0 million, $8.0 million, $5.0 million and $5.0 million, respectively, out of excess cash. Unit volume — We define unit volume as the number of our boats sold to our dealers during a period. Net sales per unit — We define net sales per unit as net sales divided by unit volume. Gross margin — We define gross margin as gross profit divided by net sales, expressed as a percentage. Adjusted EBITDA — We define Adjusted EBITDA as earnings before interest expense, income taxes, depreciation, and amortization, as further adjusted to eliminate certain non-cash charges and unusual items that we do not consider to be indicative of our ongoing operations. For a reconciliation of Adjusted EBITDA to net income, see “Non-GAAP Measures” below. Adjusted Net Income — We define Adjusted Net Income as net income excluding income taxes adjusted to eliminate certain non-cash charges and unusual items that we do not consider to be indicative of our ongoing operations and an adjustment for income tax expense at a normalized annual effective tax rate. For a reconciliation of Adjusted Net Income, see “Non-GAAP Measures” below. Trailers, parts and accessories, and other revenues — sales of boat trailers, replacement and aftermarket boat parts and accessories, and transportation charges to our dealer network. Dealer programs and flooring subsidies — incentives, including rebates and subsidized flooring, we provide to our dealers to drive volume and level dealer purchases throughout the year. If a dealer meets certain volume levels over the course of the year during certain defined periods, the dealer will be entitled to a specified rebate. These rebates change annually and include volume and exclusivity incentives. Dealers who participate in our floor plan financing program may be entitled to have their flooring costs subsidized by us to promote dealer orders in the off-season. Our cost of sales includes all of the costs to manufacture our products, including raw materials, components, supplies, direct labor, and factory overhead. For components and accessories manufactured by third-party vendors, our costs are the amounts invoiced to us by the vendors. Cost of sales includes shipping and handling costs, depreciation expense related to manufacturing equipment and facilities, and warranty costs associated with the repair or replacement of our boats under warranty. Our operating expenses include selling and marketing costs, general and administrative costs, impairment losses and amortization costs. These items include personnel and related expenses, non-manufacturing overhead, and various other operating expenses. Further, selling and marketing expenditures include the cost of advertising and marketing materials. General and administrative expenses include, among other things, salaries, benefits, and other personnel related expenses for employees engaged in product development, engineering, finance, information technology, human resources, and executive management. Other costs include outside legal and accounting fees, investor relations, risk management (insurance), and other administrative costs. Other expense includes interest expense, including related party amounts, legal settlements and change in common stock warrant fair value. Interest expense, consists of interest charged under our credit facilities, deferred financing fees, and debt issuance costs written off in connection with the pay down of amounts owed on our credit facilities. Our accounting for income tax expense reflects management’s assessment of future tax assets and liabilities based on assumptions and estimates for timing, likelihood of realization, and tax laws existing at the time of evaluation. We record a valuation allowance, when appropriate, to reduce deferred tax assets to an amount that is more likely than not to be realized. The consolidated statement of operations presented below should be read together with “Selected Consolidated Financial Data,” and our consolidated financial statements and related notes included elsewhere in this Form 10-K.
We derived the consolidated statement of operations for the fiscal years ended June 30, 2018, 2017 and 2016 and our consolidated balance sheets data as of June 30, 2018 and 2017 from our audited consolidated financial statements and related notes included elsewhere in this Form 10-K. Our historical results are not necessarily indicative of the results that may be expected in the future. Net Sales. Our net sales for fiscal 2018 were $332.7 million, reflecting an increase of $104.1 million, or 45.5%, compared to $228.6 million for fiscal 2017. 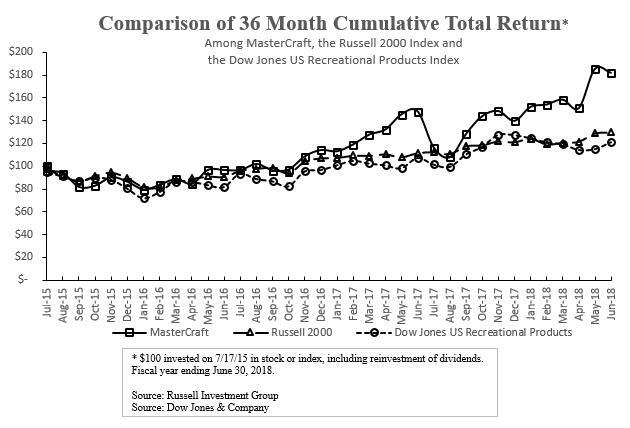 An increase of 16.5%, or $37.7 million, was attributable to MasterCraft, primarily due to an increase in unit sales volume, reduced retail rebate activity, favorable product mix and price increases. The inclusion of NauticStar increased net sales by 29.0%, or $66.4 million. Cost of Sales. Our cost of sales increased $77.2 million, or 46.7%, to $242.4 million for fiscal 2018 compared to $165.2 million for fiscal 2017. An increase of 13.9%, or $23.1 million, was attributable to MasterCraft, primarily due to an increase in MasterCraft unit volume of 10.0%, which includes a favorable product mix and higher material costs, partially offset by lower warranty costs. The inclusion of NauticStar increased cost of sales by 32.8%, or $54.1 million. Gross Profit. For fiscal 2018, our gross profit increased $26.9 million, or 42.4%, to $90.4 million compared to $63.5 million for fiscal 2017. The increase was primarily due to an increase in MasterCraft unit sales volume, price increases, lower warranty costs and reduced retail rebate activity, partially offset by higher material costs. The inclusion of NauticStar contributed $12.3 million to gross profit. Gross margin decreased to 27.2% for fiscal 2018 compared to 27.8% for fiscal 2017. The decrease in gross margin was primarily due to the dilutive effect from the inclusion of NauticStar’s gross margin. Operating Expenses. Selling and marketing expense increased $3.6 million, or 38.7%, to $13.0 million for fiscal 2018 compared to $9.4 million for fiscal 2017. This increase resulted mainly from the inclusion of NauticStar, which increased selling and marketing expenses by $1.9 million, an increase in dealer training costs, an increase in dealer meeting costs, an increase in compensation costs and increased promotion activities related to the introduction of the redesigned 2018 MasterCraft XStar. General and administrative expense decreased by $0.7 million, or 3.4%, to $19.8 million for fiscal 2018 compared to $20.5 million for fiscal 2017. This decrease resulted mainly from a decrease of $5.9 million in patent litigation costs, which was settled during the fourth quarter of fiscal 2017. This decrease was partially offset by the inclusion of NauticStar, which increased general and administrative expenses by $2.2 million, an increase of $1.7 million for acquisition-related legal and advisory fees, and $0.6 million related to new brand startup costs. Operating expenses, as a percentage of net sales, decreased by 2.8 percentage points to 10.3% for fiscal 2018 compared to 13.1% for fiscal 2017. This favorable impact resulted from leverage experienced through significant net sales increases compared to the net increases in operating expenses. Other Expense. Interest expense increased $1.3 million or 56.3%, to $3.5 million for fiscal 2018 compared to $2.2 million for fiscal 2017. The increase is due to increased borrowings under the Third Term Loan compared to the principal balance owed under the term loan component of the Prior Credit Agreement during fiscal 2017. Income Tax Expense. Our results for fiscal 2018 reflect the impact of the enactment of the Tax Reform Act, which was signed into law on December 22, 2017. The Tax Reform Act reduced federal corporate income tax rates and changed numerous other provisions. As we have a June 30 fiscal year-end, the lower corporate federal income tax rate will be phased in, resulting in a U.S. federal statutory tax rate of 28.1% for our fiscal year ending June 30, 2018, and 21% for subsequent fiscal years. We have revalued our deferred tax assets and liabilities to the reduced rates based on the period in which those assets and liabilities are expected to reverse. The incorporation of the changes resulting from the Tax Reform Act in our tax related accounts during fiscal 2018 resulted in a decrease to our year to date effective tax rate due to the revaluation of our deferred tax accounts. The fiscal year ended June 30, 2018 included a year-to-date benefit of $647 to reflect federal deferred taxes at the lower blended effective tax rate. Our income tax expense was $12.9 million for fiscal 2018, reflecting a reported effective tax rate of 24.5%. Our income tax expense was $11.7 million for fiscal 2017, reflecting a reported effective tax rate of 37.5%. Our effective tax rate for fiscal 2018 was lower than the 28.1% statutory rate primarily due to the impact of the Tax Reform Act, and a permanent benefit associated with the domestic production activities deduction, which was partially offset by the inclusion of the state tax rate in the overall effective rate. Net Sales. Our net sales for fiscal 2017 were $228.6 million, reflecting an increase of $7.0 million, or 3.2%, compared to $221.6 million for fiscal 2016. The increase was due to an increase in unit volume of 48 units, or 1.8% and an increase in our net sales per unit of 1.4%. This increase was due to price increases, as well as increased sales of higher content option packages. Cost of Sales. Our cost of sales increased $4.7 million, or 2.9%, to $165.2 million for fiscal 2017 compared to $160.5 million for fiscal 2016. The increase in cost of sales resulted primarily from a 1.8% increase in total unit volume and an increase in our cost of sales per unit of 1.1% due primarily to increased sales of higher content option packages, partially offset by lower warranty costs. profit margin and gross margin resulted primarily from price increases and sales of higher content option packages as well as lower warranty costs, partially offset by rebates associated with increased retail demand from our winter sales program. Operating Expenses. Selling and marketing expense decreased $0.3 million, or 3.1%, to $9.4 million for fiscal 2017 compared to $9.7 million for fiscal 2016. This decrease resulted mainly from reduced spending on the marketing events. General and administrative expense decreased by $8.7 million, or 29.8%, to $20.5 million for fiscal 2017 compared to $29.2 million for fiscal 2016. This decrease resulted mainly from $13.0 million in reduced stock-based compensation cost partially offset by an increase of $4.3 million in legal and advisory fees related to our litigation with Malibu Boats, which includes a $2.5 million charge to settle the Malibu patent case. Operating expenses, as a percentage of net sales, decreased by 4.5 percentage points to 13.1% for fiscal 2017 compared to 17.6% for fiscal 2016. This decrease was the result of the decrease in general and administrative expenses and selling and marketing expenses described above. Other Expense (income). Interest expense increased $0.9 million or 73.6%, to $2.2 million for fiscal 2017 compared to $1.3 million for fiscal 2016. The increase is due to interest expense incurred on the Prior Credit Agreement entered into in May 2016, partially offset by the write-off of deferred financing costs related to the debt extinguishment during fiscal 2016. There was no change in common stock warrant fair value for the fiscal 2017, as all warrants were exercised during fiscal 2016. We recognized a gain during fiscal 2016 upon settlement of a litigation matter of $1.2 million. Income Tax Expense. Our income tax expense was $11.7 million for fiscal 2017, reflecting a reported effective tax rate of 37.5%, which differs from the statutory federal income tax rate of 35% primarily due to the inclusion of the state tax rate in the overall effective rate. Our income tax expense was $8.3 million for fiscal 2016, reflecting a reported effective tax rate of 44.9%, which also differs from the statutory federal income tax rate of 35% primarily due to permanent differences relating to the change in fair value of the common stock warrant.